New England Rustic Wedding Photos often produce images that are pure works of art. This photograph, from a Vermont wedding at the Quechee Inn at Marshland Farm, is one of those images. The Quechee Inn at Marshland Farm is a lovely venue, with quaint structures and breath-taking scenery. The inn is a popular location for couples who are looking for a charming Vermont wedding venue that allows them to be surrounded by nature, but also to enjoy the comforts and luxuries that any couple would want for their wedding day. The picture, taken from a set of New England Rustic Wedding Photos from a ceremony and reception at the Quechee Inn, displays the bride and groom beneath the evening sky. The couple stand together as cool autumn air brushes by, and the sky grows darker overhead. 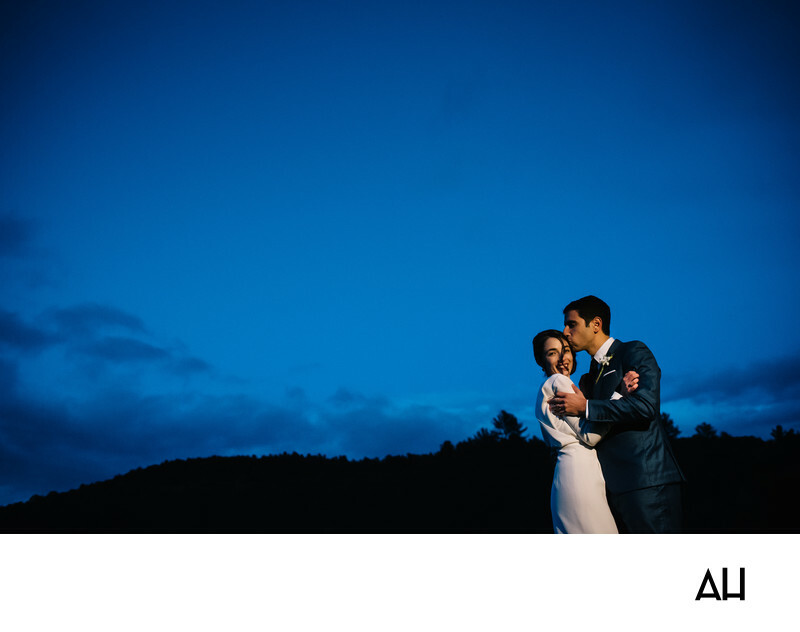 In the twilight the sky has become a deep shade of royal blue, creating an enchanting backdrop for the bride and groom. Reaching up to meet the sky is the silhouette of the tree covered Vermont mountains. The black outline mountains and the wide open sky create the illusion that the bride and groom are the only two people in the area for miles. The hold one another close against the chill of the fall air, as the groom gently kisses the forehead of his bride. It is a tender action, that causes the bride to beam. She looks directly at the camera, comfortable in the arms of her love and well-cared for by him. To be in the presence of this couple is to truly be in the presence of love.